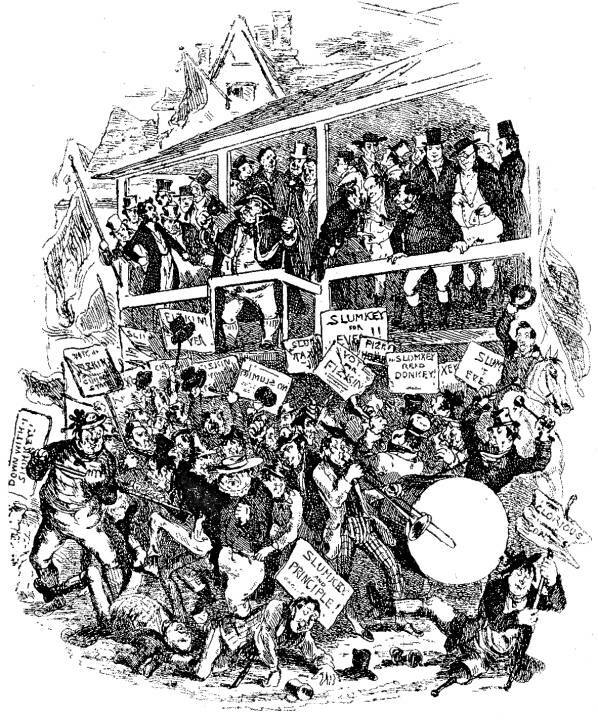 "He has come out," said little Mr. Perker — illustration by Phiz for Dickens's "Pickwick Papers"
Left: The Election at Eatanswill -- the 1834 illustration by Phiz. Right: Thomas Nast's 1870 illustration, "He's kissing 'em all!"" "And, perhaps, my dear Sir," said the cautious little man, "perhaps if you could — I don’t mean to say it’s indispensable — but if you could manage to kiss one of 'em, it would produce a very great impression on the crowd." Apparently a politician's kissing babies was then not quite so great a cliché. 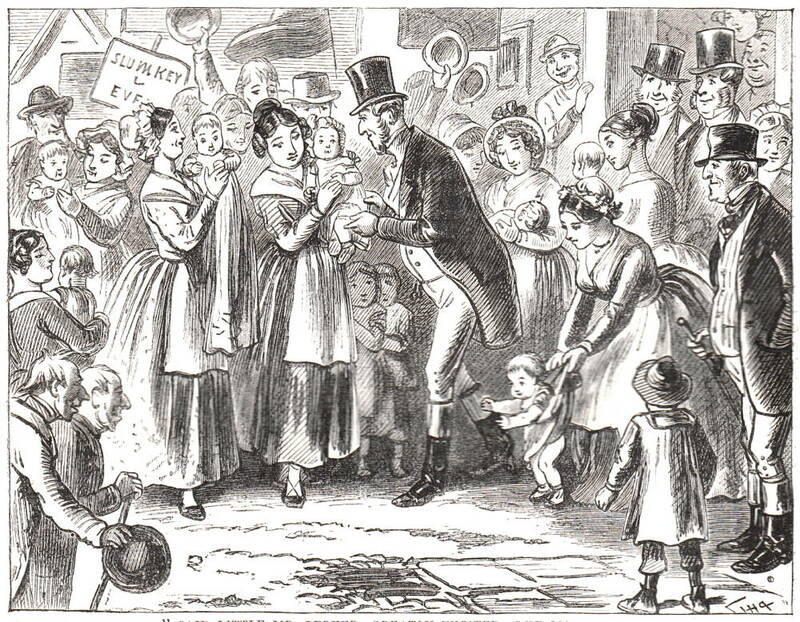 The massive presence of young women, none of whom could vote even in the 1870s, at first glance would seem an anomaly to a modern reader; however, as Perker has explained to Pickwick earlier in the election chapter, the way to securing the votes of the male electors lay through their wives and children — indeed, the Honourable Slumkey's re-election committee has already bribed forty-five women with green parasols. Now Slumkey must must the ultimate political gesture: kiss every baby presented to him. And Phiz has given us seven infants, four young children, and eleven young women, whereas the adult males in the crowd near the Town Arms (for which Nast has incorporated the sign in his design) number a mere nine, exclusive of the child-patting candidate (centre) himself. Processional signs in both Household Edition illustrations proclaim, "Slumkey forever," although Phiz's sign is missing the "for" (upper left) and the name "Slumkey" has been divided, with humorous effect. The shaggy hairstyles, disreputable hats, smock-frocks and aprons of "bully-boy" Slumkey adherents (left) in Nast's illustration together with the prominence of the sign "Town Arms" in the background (left) recalls the suborned bar-maid's spiking with laudanum the brandy-and-water of fourteen unpolled electors in the previous Eatanswill election, an anecdote that Sam Weller recounted to Pickwick before breakfast that day. Although Phiz sided with young Dickens, who was very much a Radical in the early 1830s, supporting the Great Reform Bill of Lord John Russell in 1832, Nast was a virulent opponent of governmental corruption, the New York Democratic party machine, and the Tammany Hall political clique, as well as an anti-slavery proponent (and therefore a staunch Republican). Consequently, both Household Edition illustrations take a dim view of traditional political shenanigans and "dirty tricks." Dickens, Charles. Pickwick Papers. The Household Edition. London: Chapman and Hall, 1874; New York: Harpers, 1874.